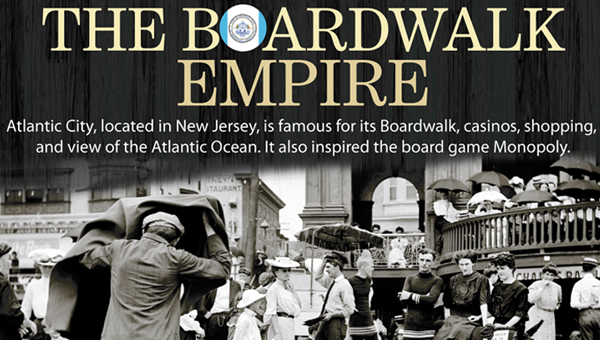 This infographic gives somewhat of a geographical and historical overview of New Jersey’s Atlantic City and its “Boardwalk Empire”, whose prohibition-era antics inspired the recent HBO hit of the same name. It’s more than just the game Monopoly. Aesthetically, each piece of art is nicely executed, although there is a bit of a style mix, here. The map is quite snazzy. I was looking for a mention of the Boardwalk Empire TV show, but it isn’t there. A bit strange, considering HBO was put in the references. I see why they wanted to stick in the Mike Tyson fact, but putting under the heading “Famous Hotels” is a bit weird. The crime statistics at the bottom seem the most out of place. The prohibition era crime notes in the timeline are worthwhile, but that doesn’t create enough of a connection for me to care about crime stats in 2007, especially with no base of comparison with other cities. I think they should have built off the strength of the map design, made it a bit bigger and integrated the hotel pictures and dates into it, and maybe dressed it up with mob information. I think I’ve realized part of that bothers me about these hodgepodge type infographics; they end, but in a way, they have no reason to. There is no clear purpose and as such no marker for when that purpose was achieved. Enough stuff is thrown together so it seems like effort was put in, but the general education hope of this piece of work leaves me a bit unsatisfied. This infographic was found through Digg. This entry was posted on August 19, 2011, 5:44 pm and is filed under Society & Culture. You can follow any responses to this entry through RSS 2.0. You can leave a response, or trackback from your own site.